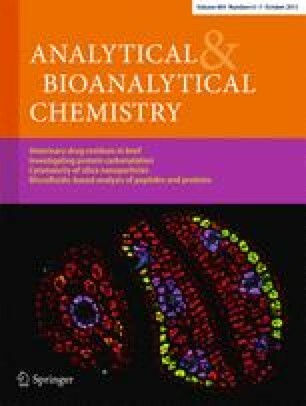 This study describe an analytical method employing gas chromatography (GC) using flame photometric detection that has been developed for the simultaneous determination of organophosphate pesticides (diazinon, disulfoton, parathion, chlorpyrifos and malathion) in strawberry samples. For this purpose, molecularly imprinted solid-phase extraction was applied as a sample preparation technique. The method was linear in the ranges from 0.10 to 1.00 μg g−1, for diazinon, disulfoton, parathion and chlorpyrifos, and 0.10 to 2.00 μg g−1 for malathion with r > 0.99. The detection limits (LD) ranged from 0.02 to 0.05 μg g−1. Recovery studies yielded average recoveries in the range of 65.25 to 87.70 %. These results showed the potential of this technique for organophosphate residue monitoring in strawberry samples. This research was supported by the National Council for Scientific and Technological Development (CNPq)/Brazil, the Minas Gerais State Research Foundation (Fapemig) (process number CDS-PPM-00055-09), the Coordination for the Improvement of Higher Education Personnel (Capes) and the Federal University of Alfenas (UNIFAL-MG).